Children's Picture Book Database at Miami University | Oh! Oh!How white everything is in the morning when it snows. Everyone wants to play in the snow. Squirrels, cats, dogs, rabbits, and children get excited to play in the snow. When the sun goes down, the snow looks blue and play time is over for everyone. 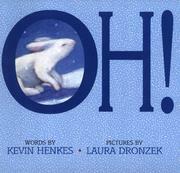 Henkes, Kevin, “Oh!,” Children's Picture Book Database at Miami University, accessed April 24, 2019, https://dlp.lib.miamioh.edu/picturebook/items/show/6685.